What you are about to read is scary, very, very scary. In Malaysia we hit a coral outcrop at 5½ knots and Skylax reared skywards and then came to a stop. We slid off the side and immediately carried out an inspection. You can find the details on TELL-TALES in the blog on SE Asia.Everything seemed fine and anyway facilities for fixing any problems are remote in Malaysia and Thailand. Not that it can’t be done, but dropping the keel and carrying out repairs is more than difficult in Malaysia or Thailand. There aren’t really any yards and expertise there that I’d trust 100% to do it. But I knew someone in Turkey. We sailed Skylax back to Turkey and hauled Skylax at Didim Marina under the aegis of Yachtworks. Then we returned back to London for work. In the meantime Yachtworks got down and dirty. The photos below illustrate dropping the keel, discussing the problem and the eventual solution we arrived at. The nuts from the keel bolts are removed and the keel dropped. I email the designer of the winged keel (Alan Ladd Marine in Massachusetts) and the designer of the boat (Alan Warwick in NZ) but don’t get any useful info on the keel construction and what happens inside the lead keel. It makes sense to renew the keel bolts though it needs some consideration. The following points should be addressed. 1. Keel bolt material. For cast iron keels like Tetra mild galvanised steel works although iron would be best. For a lead keel ideally monel bronze should be used, but its difficult to work and to make new bolts if not in stock sizes. The stainless bolts (presumably 316) have lasted 21 years. While prone to crevice corrosion, most production boats use stainless bolts. With some additional care (5200 and maybe caulking string around the top) they should last a goodly amount of time and would probably be my option unless persuaded otherwise. 2. We need to find out what the keel bolts go into, whether it is a fabricated stub (maybe in s/s) or into lead. That is, is the lead keel right up to the hull or is it on a stub of some sort. If it is a s/s stub then there is little point in using any other than s/s keel bolts. 3. Getting the present keel bolts out. Lots of keel bolts are moulded into the lead with a J on the bottom. This makes them exceedingly difficult to remove. For example if you cut a window to get at them you remove some of the strength of the lead keel. I don’t have any definite answers to any of this but maybe with a little investigation we can find out. Once the keel had been dropped then it was obvious that the backing plates had damaged the keel bolts with the impact and there was some local corrosion, part of this because of age and part because the impact had disturbed the hull to keel joint and seawater had seeped in to start some crevice corrosion. ‘straight’ and will just screw out? Or??? For replacing the keel bolts I’d just use 316 again. I mentioned this when I emailed him on keel bolts and was talking to a journalist friend yesterday who tests new yachts for Yachting Monthly and does a yacht report on them. He gets through a dozen or so new yachts every year, from Najads to Halberg Rasseys to Bavarias etc. He can’t remember any of them using anything but s/s for keel bolts! I am a friend of mild steel when it comes to keelbolts. I am sure your journalist knows that not all 316 are equal. Stainless steel can trip from the (desired) passive state into an active state without even a clear reason and this is massive disaster if not smoking **** outright. My chemistry teacher and my humble selves used to manufacture diving belt buckles in ss and then passivate them in king’s water… Rod, that was back in 1970. Dear Rod, after dismantling of the keel and cleaning of the threads we had the opportunity yesterday to study Skylax’ keelbolts. Skylax is equipped with 7 rows of keelbolts, rows 2 – 5 are double bolts, rest are single – 11 bolts altogether. 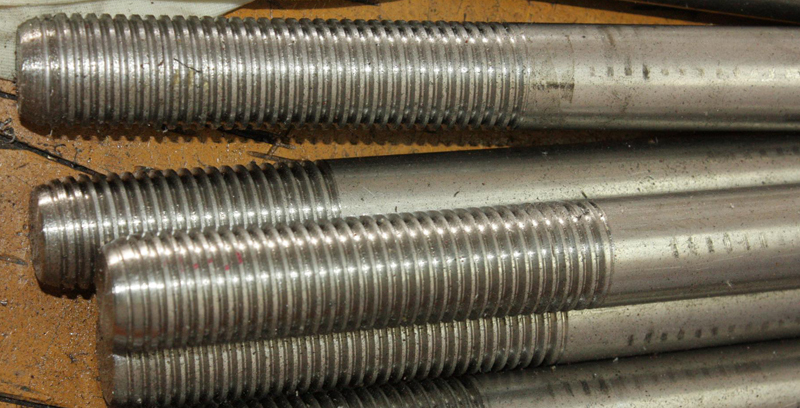 All bolts are of the same diameter, 25 mm approx. Material is stainless steel. I should test them whether 316 or 304. The mating plane of the GRP hull is about 30 – 35 mm thick. The damages are extensive and on various levels. Damage starts to the unthreaded root in the GRP (KB7), to various levels above the GRP hull, up to the top of the bolts. At least 8 of the keelbolts are in need of replacement due to loss of cross section, loss of passivation, introducing of stress areas and loss of thread. Rest is endangered due to damage to the passive surface. See spongy structure even at “healthy” threads. Hereby mind the carried away thread tips, reducing the mating surface between bolt and nut and creating the conditions for stripping. Some of this damage may be result of stagnant water “sitting” within threads for extended time. But the damages within the GRP or just above the GRP hull may be related to grounding reported last year. Hereby, the rather uniform of loss of material in all areas must not be considered as an argument in favour of uniform sources of the damages. The corrosion of stainless steel is not proportional to exposure time. Considering that most damage to threads starts about 20 – 30 mm above the keel mating surface: Another possibility worth studying would be to tap the bolts about 25 mm into the lead keel, cap them, passivate them and put on sleeve bolts. See Drawing attached. I have never encountered this remedy before. Roughly 35 mm OD bolts should suffice to add about 125% of the original cross section. If you are not uncomfortable with this solution we shall investigate it further. For sure this solution requires frequent checking of the bolts in the next seasons. I’ve been racking my brains trying to think why sleeving would not be appropriate. So far nothing concrete and I’ve talked to a few friends with engineering skills and they really couldn’t come up with anything. Also Catalina Yachts recommend sleeving as a way of fixing corroded keel bolts. 1. Looking at your photos it appears that some of the damage was where the plates under the nuts are positioned. It may be that some of this was due to the impact of the keel on coral in Malaysia although it may be that the damage was encouraged by some corrosion. 2. I think it would be worthwhile reaming out around several of the keel bolts to the depth suggested in your drawing to make sure there is no corrosion of the s/s bolts in the keel itself. If there is corrosion say 25mm down in the top of the keel (to the bolts) then we are in the poo. 3. I guess it worth sleeving all the bolts? 4. Engineering wise I would have thought the sleeved structure would be stronger than the original. 5. Looking on the internet I’m surprised how few keel bolts there are in some production boats. For a 38 footer for example there were 6 keel bolts of pretty small diameter holding the keel on. Also I know on Beneteau 44.7’s there are very few keel bolts into very little fibreglass. I looked at one where the keel had come off after Hurricane Ivan. 6. I expect that other Cardinal 46’s just keep on going with a bit of corrosion and given Skylax came to a halt at five and a half knots, nothing really moved that much even given some native corrosion. 7. I’m still trying to contact Ladd Marine re the keel design but no email and no reply to my phone messages so far. A bit of a hiatus while Yachtworks looks at different possibilities and then comes up with an idea. A whole lot of photos start arriving. The old sleeving idea is rejected because of stress points on the old bolts being accentuated. Also the old keel bolts do have a ‘J’ shape cast into the keel so removing them is not going to be easy. Looking at the photos you seem to be boring into the keel to locate the bolts? armature? It occurs to me that we need to think about how we seal the holes. The Canadian company Mars Keels who replace keel bolts (http://www.marskeel.com/services/3 ) refills with lead. The problem here for me is keeping the integrity and strength of a cast lead keel with keel bolts in it. Any suggestions? The keelbolt renewal is progressing. We both are confident, that your keel will not fall off the next 200 years or so, please be relaxed. Old bolts are tested to be 316 grade. So the solution that Yachtworks came up with was to drill 30mm plus holes horizontally through the keel where the keel bolts go down into the keel. Solid s/s 316 stock was then measured and threaded on the horizontal bars into which the new keel bolts threaded down into. The horizontal s/s stock is put into place with sealant and the new keel bolts (custom made 316) then threaded into them again with sealant. As Yachtworks states… these are not going to come out for 200 years. The whole keel is then faired and filled and epoxied. So if you have keel bolts over 20 years old and especially if you have had a grounding or collision of any sort, it would be worthwhile dropping that keel to examine the keel bolts. You can’t see if there is any corrosion or damage by just inspecting them from the top, although you can get a bit of an idea.